Conquering the Antarctic with Byrd. 032. RICHARD E. BYRD. Issued by Wischmann's Picture Pack Gum (1930s). From a series of 25 entitled 'Aeroplane Series.' Size: 1.35" x 2.47". 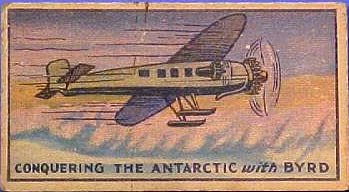 Verso: Richard E. Byrd led an expedition to the Antarctic in | his Ford plane called the "Floyd Bennett." With three | companions he flew over the South Pole on November | 29, 1929. | AEROPLANE SERIES | 1-25 | Packed with WISCHMANN'S | PICTURE PACK GUM | This educational card is one of a contemplated series | of 250 different kinds.